The University of North Carolina Sleep Disorders Center is a multidisciplinary specialty group dedicated to providing state-of-the-art health care, developing cutting-edge research and offering top tier educational programs in the area of sleep medicine. This program is a division of the UNC Department of Neurology and incorporates a team of doctors across several specialties. Sleep is essential to good health and poor sleep leads to increased health costs and a lower quality of life. Sleep disorders produce a wide range of health and behavioral manifestations and decrease performance. Nearly one in three individuals endorse one of the major sleep complaints. The UNC Sleep Disorders Center provides care to patients with a wide range of sleep-related complaints and offers a full range of behavioral, pharmacological, surgical and device-related therapies to improve the symptoms and long-term health effects of these disorders. The center is accredited by the American Academy of Sleep Medicine as a full-service sleep center. Complete sleep evaluations for adults and children are provided through initial consultation in the UNC Sleep Clinic and may include polysomnographic study in the UNC Sleep Disorders Laboratory. Our sleep neurologists, Bradley Vaughn, Heidi Roth, and Zheng (Jane) Fan (pediatric sleep medicine) are board-certified in sleep disorders medicine and are nationally recognized leaders in the area of sleep medicine. These physicians work in concert with physician assistant Phillip Isaacs and family nurse practitioner Christine Shooter to provide in-depth quality care. The Sleep Center also offers subspecialty services. The Restless Legs Syndrome Clinic operates as a combined service of the Sleep Center and the Division of Movement Disorders. Sleep-related surgical services are lead by Dr. Brent Senior, Chief of the Division of Rhinology, Department of Otolaryngology, and Dr. George Blakey, Oral Maxillary Facial Surgery. Dr. Rose Sheets directs the Sleep Dental Device Services that offers a wide array of dental device options. 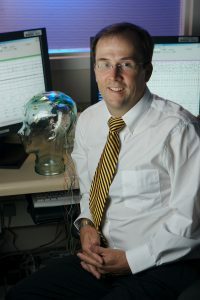 The Sleep Center also utilizes Dr. Eric Jensen, who directs the Medwell-BioFeedback program as a consultant for biofeedback behavioral therapies. Pediatric sleep-related airway services are provided by a multidisciplinary team at the NC Children’s Airway Center.